Wikipedia informs us: “On October 20, 1968, Jackie Kennedy married Aristotle Socrates Onassis, a wealthy Greek shipping magnate, who was able to provide the privacy and security she sought for herself and her children. The wedding took place on Skorpios, Onassis’s private island in the Ionian Sea, in Greece.” We now know that Jonas Venture, Sr and the rest of the original Team Venture were at the wedding. Jonas had spent the afternoon diving for treasure and then sped off with the boys to get drunk and experience some high society. In other words, “fortune and glory.” Of course, the seeking of fortune and glory necessitates the abandonment of Jonas’s son Rusty, the protagonist of our current narrative. Rusty, playing at being Theseus, “slays the Minotaur” (HELPeR wearing steer horns), and Jonas chides him for not learning “the classics.” The story of Theseus is, of course, about as classic as tales go, indicating that Jonas hasn’t been paying attention to Rusty on a couple of different levels. Whatever Rusty’s abandonment issues, in the present he can’t wait to relive the joy he feels on the island of Spanakos during their festival of Spanikopita. Ordinarily, Rusty’s m.o. is to inflict his undigested childhood trauma on his children, but in Season 5 he’s losing control of those children and, in a further inversion, he now seeks to inflict a childhood joy, not on his children but with his pale friends, his fragile, lame, broken-down Team Venture Mark II – his child-molester bodyguard, hydrocephalic dwarf friend and that friend’s albino roomate (who really, really doesn’t want to go). Rusty is overjoyed to return to Greece and revisit the scene of his bliss, but it becomes clear fairly early on that “Spanakopita” is not a real festival. Rather, it appears to be an elaborate show put on for the benefit of one man. It’s kind of like The Game, but with a more benign intent. The holiday is darkened by the appearance of Augustus St Cloud, Billy’s arch-rival. St Cloud has purchased not just “Bubo” from Clash of the Titans but also the X2, the very ship Rusty was abandoned on those many years ago when he first came to Spanakos. St. Cloud collects not just artifacts but memories – it’s not enough for him to own a thing, he must own the mind of the person associated with that thing. When Rusty sees the X2 in the harbor he assumes it’s his brother JJ who has come to spoil his vacation, and he’s not far wrong: St Cloud enters the narrative as a kind of crypto-JJ, a man intent on ruining the only thing that makes Rusty happy. There is a series of contests to celebrate Spanakopita, all of which are entered by only our Ventureverse tourists. The winner of the contests receives drachmas and the holder of the most drachmas at the end of the festival is given the ceremonial crown (which, oddly, is not made of laurel leaves). What does Rusty want? His childhood joy renewed. What does St Cloud want? to rob Rusty of that joy (and another pop-culture artifact, the X1). He therefore cheats to win all the contests. St Cloud, petty even by Venture-verse standards, will stop at nothing to rob Rusty of his joy. Billy (after having a metaphor-laden dream that imagines the original Team Venture as Greek gods, Pete as Pegasus/Icarus and Rusty as a Gorgon) realizes that the way to beat St Cloud is to simply steal from him the drachmas he’s won. The contests are rendered valueless as the true contest becomes who can possess the most signifiers of success. Meanwhile, Hatred learns the true meaning of Spanakopita, through the time-honored detective work of “walking in a door and pointing a gun at a guy.” The host of Spanakopita doesn’t even put up a resistance to Hatred and offers him a confession: Spanakopita began on that day in October 1968 when the wealthy, including Jonas, came to party for Jackie O. Incensed at the flaunting of wealth, the people of Spanikos robbed the empty yachts in the harbor of Skorpios, taking a huge haul of swag, and Rusty. Rusty was playing “Trojan Horse” with HELPeR on board the X2, another “classic” Jonas says he’s been ignoring. Which brings me to what I think is the real meaning behind the episode: the creation of myths and their meaning to a culture. The people of Spanikos created Spanikopita because they couldn’t get hold of Jonas to ransom Rusty to him. Heartbroken by Jonas’s neglect, they created the festival to cheer up an abandoned boy. So, let’s break this down. There is an island of indigents who loot the vessels of the wealthy, looking for treasure but finding a boy. They try to ransom the boy but the father doesn’t respond. They create a false festival involving goats, sponges and spinach pie in order to cheer the boy up, and the boy cherishes that golden moment for the rest of his life. Well, that’s Saturday morning cartoons, isn’t it? The poor (say, Hanna-Barbera) rob the rich (say, Jackie Gleason) of their riches (The Honeymooners stolen to become The Flintstones) and gain a captive audience of children who have been abandoned by their parents. Having gotten the attention of those abandoned children, the villagers entertain them with meaningless rituals (Scooby-Doo and all its ilk) and the children cherish those meaningless rituals for the rest of their lives – that junk has filled the hole in their hearts caused by their parents abandonment. Jonas didn’t answer the phone when the kidnappers called because he was fighting L. Ron Hubbard, who was, at that very moment, creating his own brace of meaningless ritual to fill the lives of abandoned children. 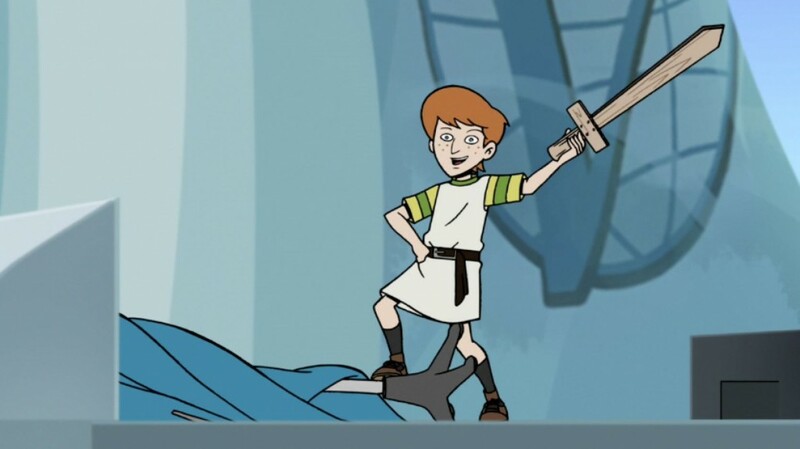 The artifacts of ancient Greece stick around long enough to go from mundane household junk to museum-quality showpieces, and eventually people, like St Cloud, will go to great lengths to attain those artifacts, just as Jonas is seen doing at the beginning of the episode. We are all diving for treasure, searching for meaning in the meaningless, it’s the dive itself that forms our lives. I think that they were riffing off of John Fowles the Magus, not the Game. You’re better read than I. It leads me to believe(esp after everyone’s triumph in “what Color is your Cleansuit”) that the season finale is going to have everyone lose. Hey, SCOOBY DOO, MYSTERY INC. was pretty damn good. And disturbing. I cannot ever remember another ostensibly for kids cartoon that had a helpless and cornered teenage girl gunned down by Nazi robots. And no, I’m not making a joke. I’m not familiar with Mystery Inc., but Scooby-Doo and its legion of copies were utter garbage. Hanna-Barbera single-handedly, and intentionally, lowered the standards of American animation. Hanna-Barbera single-handedly established cartoons on TV as a thing. Yeah, SCOOBY-DOO: MYSTERY, INC (Two seasons, 2010-2012), is rather different, much more meta, than the rest of the SCOOBY-DOO oeuvre. For example, Harlan Ellison guest-starred twice. Even more of a departure, a running storyline rather than purely episodic shows. Heck, each episode is referred to as a chapter. There is a VB-esque vibe to it, Todd, so you may want to give MYSTERY INC. a look when you have a chance. Having just finished the first season of “Mystery: Incorporated” on Netflix, I’ve gotta third this recommendation. It’s startling and surreal to see cardboard stereotypes suddenly gain psychological depth (there are REASONS why Fred Jones is such an idiot) and inner lives. Even if it weren’t clever, compelling, and surprisingly funny, it’d be worth watching just for the way they address the looming Scrappy-Doo issue. Yes, Mystery,Inc was a revelation, I didn’t go in believing. It looks and sounds like something that has intelligence behind it. I agree it even has a touch of VB inspired feel, from the opening to its observations on relations and the five characters in the van. It just goes to show what could happen if they actually put some effort in the otherwise straight-to-parody Scooby Doo. Great recap, thanks! I don’t think you mentioned it but we learned that Brock, too, has abandoned some children. Hardly a surprise–and very funny, the way those blonde mullets drifted into frame–but quite poignant in the context you’ve discussed here. I’m over St Cloud, though–enough already, there are too many genius characters on the show to waste more time on a one-gag pony like him. Can we address why Hank was still dressed as Destiny? Personal choice or he just can’t get the suit off? Seemed like personal choice to me. He literally feels stronger dressed as a woman. Almost as glad to see new episode analyses as I am the new episodes themselves. Speaking of meaningless rituals, does anyone know if “What Goes Down Must Come Up” and this: http://www.youtube.com/watch?v=QgdjRlo36h0 episode of “Chip & Dale’s Rescue Rangers” are both referencing a particular source, or just arrived at similar takes on the cargo cult phenomenon? I confess, I just found myself transfixed by the weird thematic echoing of the Monarch’s temporary evolution from way back in “Dia de Los Dangeros!” Apparently the power of an abandoned child is one of the few things in the Ventureverse that can break through to folks intent on profiting from kidnapping, no matter how intentional. One of my favorite jokes in the episode was not actually a written joke but the implication that Rusty has been dragging Hank and Dean to Spanikopita for years and beating them in the “games”. It’s a nice touch as it jibes well with many of the episode’s themes. I found it interesting (if likely a production coincidence) how the famous people St. Cloud has bragged as being “friends” with so far are Steve Jobs and Ray Harryhausen, both now dead. So St. Cloud has friendships with people who were famous and/or notable in their respective fields, but since they are deceased, the friendships retain far more exclusivity and “rarity” (that fanboy catnip) than any other human relationship. Wasn’t the X1 effectively destroyed in the Venturestein one? I only bring it up because this show is usually a stickler for that kind of continuity. I wondered about that too. Apparently they got it fixed up. Another parallel: Keeping Rusty in the dark about the truth of Spankopita for his own happiness and psychological well being = keeping Hank and Dean in the dark about their clone status for the same reasons. Your concluding paragraphs were some inspired readings. The idea of something like re-purposing into new narratives whatever remains of certain myths, makes sense in this setting of Greece, that seemed to stand in like a collection of signs pointing to failed/corrupted national economies and by extension sense of identity. The story opens on a divide, already set up between the 1960s poverty island / Onassis jet set. The once-national currency, the Drachma, is worthless since the Euro, now gaining meaning only in a nonsense game. And as you noted already in the 1960s Jonas doesn’t recognize the myths, narratives which provide a society a past meaning in order to work with a future, are worthless currency as well. Revenge seems to be the one driving force that remains, on the island and in the world, and it is easily satisfied with money too. The proprieter, losing his eye to the father of Rusty, and swearing revenge on the boy, is satisfied by the yearly monetary exploitation. Which considering Rusty’s blissful state, represents a modern win-win equilibrium of sorts. The episode stands out as well as the first this season not to riff on “push”. Why is Pete White’s sunlight allergy suddenly a true detriment, but he’s playing football outside in “Assisted Suicide” with no trouble?